1.1 What Are the Best Types of Mattresses for Adjustable Beds? 1.3 Should You Buy Adjustable Mattress Bundle With A Bed Frame? What Are the Best Types of Mattresses for Adjustable Beds? There are thousands of options available for consumers to choose from when searching for an adjustable bed compatible mattress. The most suitable option for your needs is usually dependent upon your personal preferences as well as the quality of components and the thickness of the mattress. Before pulling the trigger on any type of mattress for an adjustable base, it is important to verify that it is durable and flexible enough to bend to the natural contours of the adjustable bed frame without suffering structural damage or a reduction in performance. Consumer feedback shows that Memory Foam and Latex Foam Mattresses are the most popular options on the market. Innerspring and Air Beds are also used by a smaller number of consumers on their reclining beds. If you are looking for a top quality mattress to pair with an adjustable base, choosing memory foam or latex mattress is the wisest choice at the moment. As long as you opt for a model made with high-grade components by a manufacturer that relies on the latest industry standards, you can be sure that it will bend to the curves of the adjustable bed while keeping its ability to support the body and general structural integrity intact. Memory Foam is the number one type of foam for reclining beds by a mile. Renowned for their natural ability to conform to the body’s most delicate pressure points, mattresses made from memory foam flex with ease to the curves of adjustable mattresses without sacrificing comfort and support. If you prefer the buoyancy effect of latex for whatever reason, then make sure you choose one that comes with a thinner size so conforming to the curves of your adjustable base can be achieved with limited stress. Innerspring mattresses used to rule the market many decades ago before revolutionary foam mattress technologies became popular. They usually come in the form of thousands of coiled springs with a padded top. Due to their components, fitting most standard units on adjustable beds can be a very daunting task. However, many manufacturers are responding to the tide by releasing models with more flexibility. You are bound to get minimal pressure relief support and comfort if you choose to fit an innerspring mattress on your reclining bed. While coiled spring mattresses can be cheaper than latex and memory foam, keep in mind that the cost of replacing them frequently can add up over time. It is simply not worth it in our humble opinion. Air beds are another option available to consumers seeking a feasible mattress for an adjustable frame. They are manufactured with one or multiple air chambers that can be inflated with the aid of a pump to your desired level of firmness. These mattresses can equally be deflated to reduce firmness or even to make the mattress completely flat for storage. If you decide to go down the airbed route, it is important to select one with multiple built-in air chambers. This is because single-chamber models are usually less flexible. Also, keep in mind that airflow can be impeded at the bended points which can essentially reduce the support offered to your pressure points. If you are serious about finding the best mattress for an adjustable bed, you should consider the thickness of each model before going ahead to order it. Typically, the most suitable mattress thickness for adjustable frames typically ranges from 6-14 inches depending on the type of foam used. The soft nature of Memory Foam means that you can target models anywhere from 8-14 inches thick if you want the ability to rest comfortably in your reclining bed. However, one of the biggest faux pas you can make is to choose a 12 or 14-inch natural latex foam mattress for an adjustable bed. Due to the naturally more rigid nature of these mattresses, flexing thicker models to suit the curves of the bed can be next to impossible. 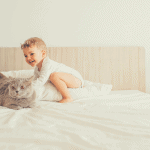 Even if you manage to bend it successfully, be rest assured that a 12 or 14-inch latex mattress could suffer serious damage that can significantly reduce its lifespan. 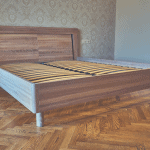 Therefore, the best latex mattress for adjustable beds are usually 6 inches thick to generate optimum performance. The Classic Brands Cool Gel Ventilated Gel Memory Foam is the perfect option for your adjustable electric bed if you find the 10-inch and 12-inch models too dense for your liking. 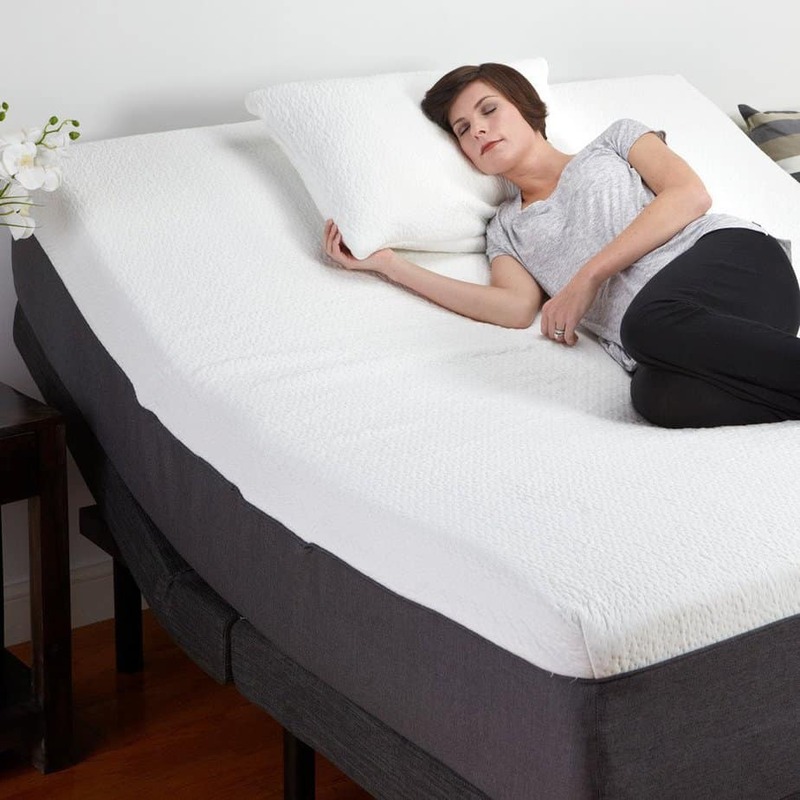 It features 2 inches of premium quality gel memory foam at the top, supported by 6 inches of High Density Memory Foam to provide just the right amount of support required by the body. Proper spinal alignment and pressure point relief are provided day in day out to enable you sleep with all the luxury in the world. In addition, the mattress’ conforming capabilities are further optimized by the aesthetically powerful all-round 4-way stretch cover which coordinates with the embedded gel memory foam. This results in a unique sleeping experience even for well-traveled consumers with a knack for sleeping in luxurious hotels. The CertiPUR-US certification of the integrated memory foam is proof of its quality and natural hypoallergenic properties. 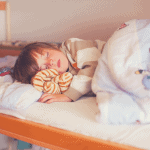 Sleeping on it protects you from bacteria, mold, dust mites, and other unhealthy microorganisms. The Classic Brands Cool Gel Ventilated Gel Memory Foam is loaded with an endless range of special features. ​We have been pleasantly surprised by how cool it feels to sleep on even in tropical areas of the country. The gel foam has proven to have an innate ability to draw heat away from the body. This comes in handy especially for couples or single parents who share beds with their young children. The DynastyMattress Cool Breeze 12-inch is believed by many current users as the best mattress for an adjustable bed. It is renowned for its excellent customer ratings online and offline. 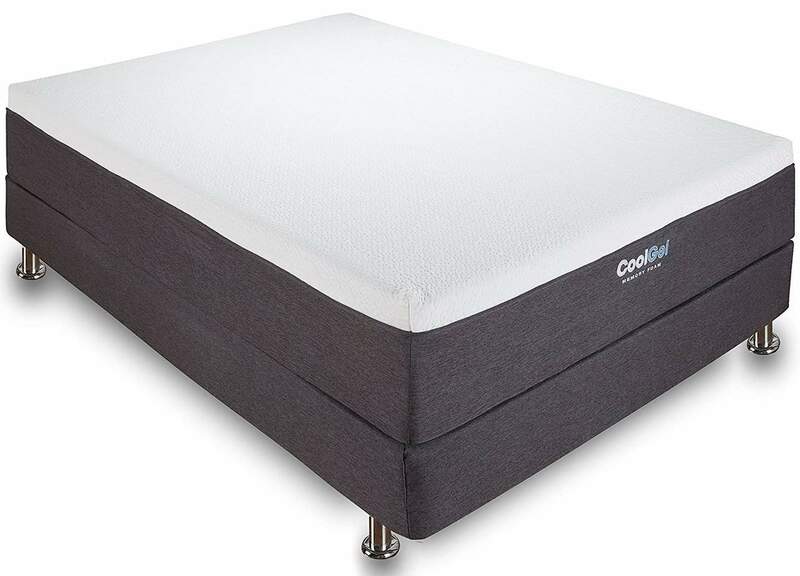 Featuring a 3-inch Comfort HD Memory Foam at the top, this model takes breathability to the next level by incorporating the most advanced technologies proven to help everyone sleep cool regardless of room temperature. Heck! If you are looking for a gel mattress that guarantees breezy nights on your favorite adjustable bed, you may have just found it. The mattress comes with a 4-layer foam construction to stretch durability while giving you absolute comfort now and for many more years to come. Why else do you think the manufacturer offers a 30-year limited warranty for each purchase? It is available in a variety of sizes ranging from Twin to Twin XL as well as Full, Queen, Split King, and Split California King. The DynastyMattress Cool Breeze 12-inch quickly turns doubters into fans immediately after coming into close proximity. It delivers the ultimate cool night’s sleep thanks to the myriad of technologies introduced by the manufacturer to ensure pressure relief and high-end breathability. ​This mattress is available at a fraction of the cost when compared to rival models of similar quality such as the Tempurpedic Rhasody Breeze. With a 120-night risk-free sleep trial, you get ample time to decide whether it meets your expectations or return it at absolutely no cost to you. 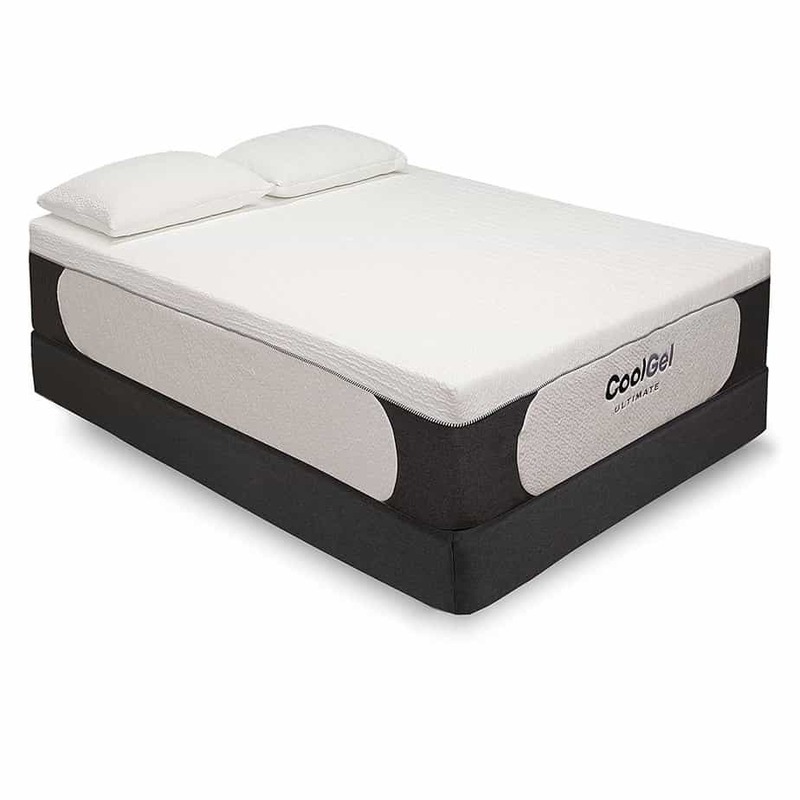 The Classic Brands Cool Gel Ultimate 14-inch is a deluxe pressure-relieving memory foam blended with High Density Breathable Memory Foam to enable a deep night’s sleep. Essential support and comfort is offered in the form of a beautifully tailored mattress that catches the eye instantly. It is enhanced with a stretch knit cover designed with waterfall edge and side panels featuring matching knits. Struggling to sleep on your current adjustable bed mattress? A plush and comfortable sleeping surface awaits you thanks to the Gel infused Ventilated Memory Foam integrated into this unit. Delicate pressure points of sleepers get relief from the high density nature of the memory foam, ensuring that it conforms to every part of your body to enable the right level of support needed to sleep like royalty. The manufacturer is renowned for offering incredible customer service 7 days a week so that the most pressing questions and problems can be resolved within the shortest possible time, if any. The Classic Brands Cool Gel Ultimate 14-inch is one of the top mattresses for electric beds and there’s no 2 ways about that. One of the truly astounding features it brings tbled with ease. 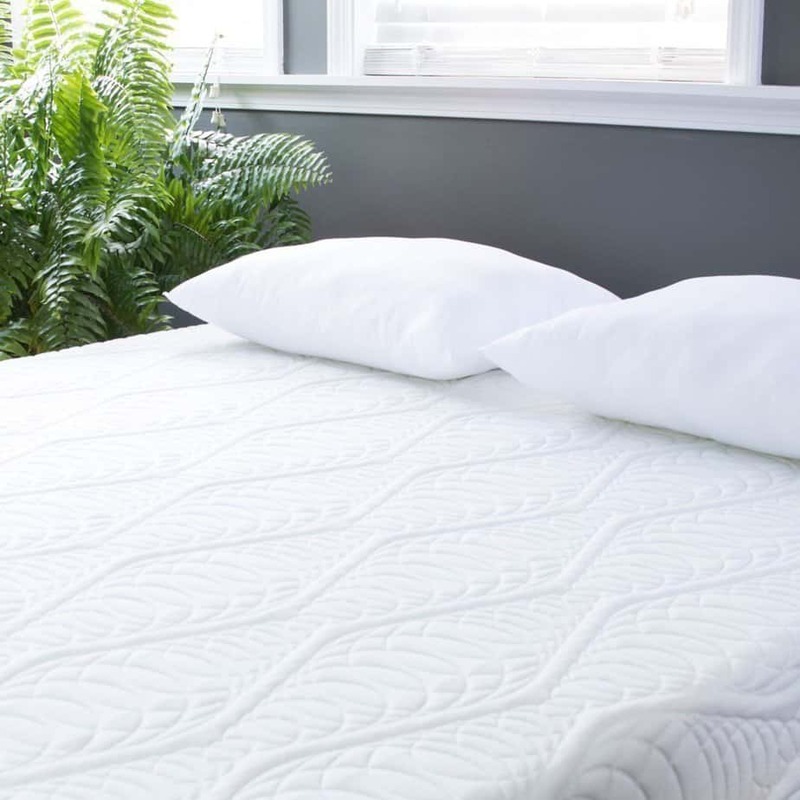 The Artic Dreams 12-inch Cooling Gel Mattress is engineered to let you escape the heat that comes with most traditional mattresses on the market today. Made from advanced Energex Visco Elastic Foam, this unit offers all the perks of traditional memory foam minus the slow recovery process. 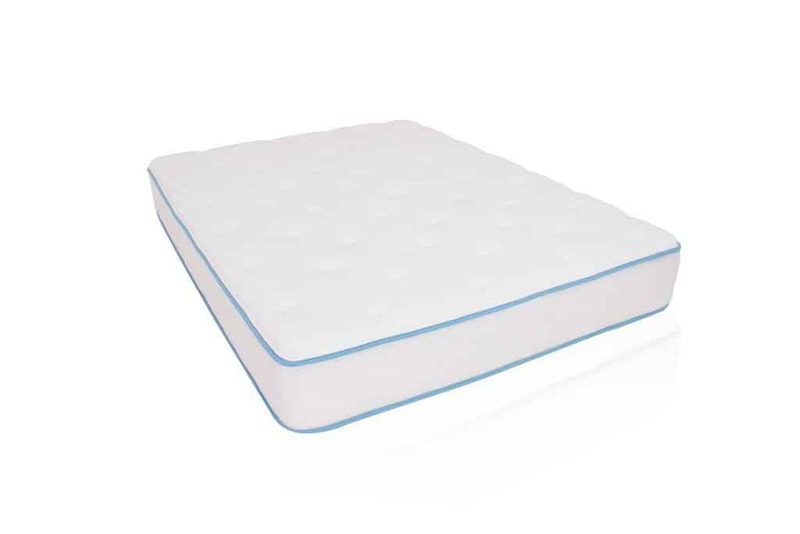 It delivers superior pressure-mapping characteristics when compared to latex and innerspring mattresses. This translates to outstanding pressure relief to users compared with the 2 conventional types of mattresses at an unbeatable price tag. 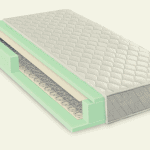 This multi-layered foam mattress is perfect for adjustable bases of corresponding sizes. It also features a 0.75-inch extremely soft quilted top over a 3-inch quick-response Energex Visco Foam with a support base of an 8.25-inch high density polyurethane foam. According to the manufacturer’s scale, this gel mattress comes with a comfort level of Medium/Plush. If you find the 12-inch model too tall for your traditional bed or adjustable base, you can opt for either the 8-inch or 10-inch model. The Artic Dreams 12-inch Cooling Gel Mattress is a true wonderful model everyone gets to appreciate the moment it is assembled at home. Consumers continue to be impressed by its sleeping comforts many years after purchase and it is easy to see why. ​The manufacturer has shown a real commitment to giving consumers the right to enjoy their sleep by providing unrivaled support. The gel-infused super breathable foam regulates sleeping temperature and makes those sweaty nights in bed a distant memory. This is why we believe it is one of the best mattresses for adjustable frames. The Perfect Cloud UltraPlush Gel-Max 10-inch Memory Foam Mattress gives you the chance to treat yourself to the most comfortable bed you’ll ever sleep on. It is designed to be used flawlessly on solid deck beds, adjustable beds, and other platforms. 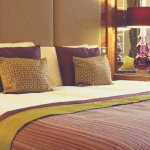 Looking for 5-star luxury on an exclusive mattress without having to break the bank? It doesn’t get better than the Perfect Cloud UltraPlush. The top features a 1.5-inch layer Air Infused Gel Memory Foam to keep your skin cool and fresh no matter what time of the year it is. In fact, most consumers say they love this mattress because sleeping on it gives them the same feeling as a 5-star hotel bed. A 2-inch Gel Max Memory Foam serves as a second layer to enhance sleep temperature regulation while providing additional comfort for the body. This layer provides auxiliary support for the top to enhance body conforming properties, thereby ensuring guaranteed rest regardless of your current health. The Perfect Cloud UltraPlush Gel-Max 10-inch Memory Foam Mattress is an Amazon-exclusive mattress that can’t be found anywhere online or offline. This means purchasing it invokes the legendary Amazon customer service we have all come to know and appreciate. Need to return the mattress within the sleep trial period? Just get in touch with Amazon customer support and be rest assured that it’ll be handled with no stress in accordance with the retail giant’s renowned Return Policy. The Classic Brands Cool Gel Memory Foam 12-inch Mattress gives you the ultimate comfort and support you crave while sleeping or just relaxing on an adjustable bed. Manufactured from premium-grade gel memory foam, this model is refined to give everyone a plusher and cooler sleeping platform. The highly porous nature of this foam promotes increased breathability to keep the skin cool all night long. 2.5 inches of gel memory foam sits at the top surface followed by 3 inches of poly gel memory foam for increased breathability and a further 6.5 inches of high density memory foam to provide maximum support and comfort. Whether you prefer a box spring or traditional bed, the optimum conforming properties of this mattress means it quickly adjusts to the sleeping surface to ensure even contact with all of the body’s contours. The foam is CertiPUR-US certified thanks to its proven natural anti-dust mite, anti-mold, and hypoallergenic properties. The Classic Brands Cool Gel Memory Foam 12-inch comes with lots of great perks unmatched in rival brands. However, our team of experts has been very pleased with the manufacturer’s 7-star customer service which is available 7 days a week. Have a question about your mattress? or need to take advantage of your existing warranty?Just get in touch with the extremely helpful customer service representatives and your issues will be resolved swiftly. The eLuxurySupply Gel Memory Foam 10-inch is a top quality model which is hand-assembled by skilled industry professionals to ensure the highest levels of performance throughout its long lifespan. 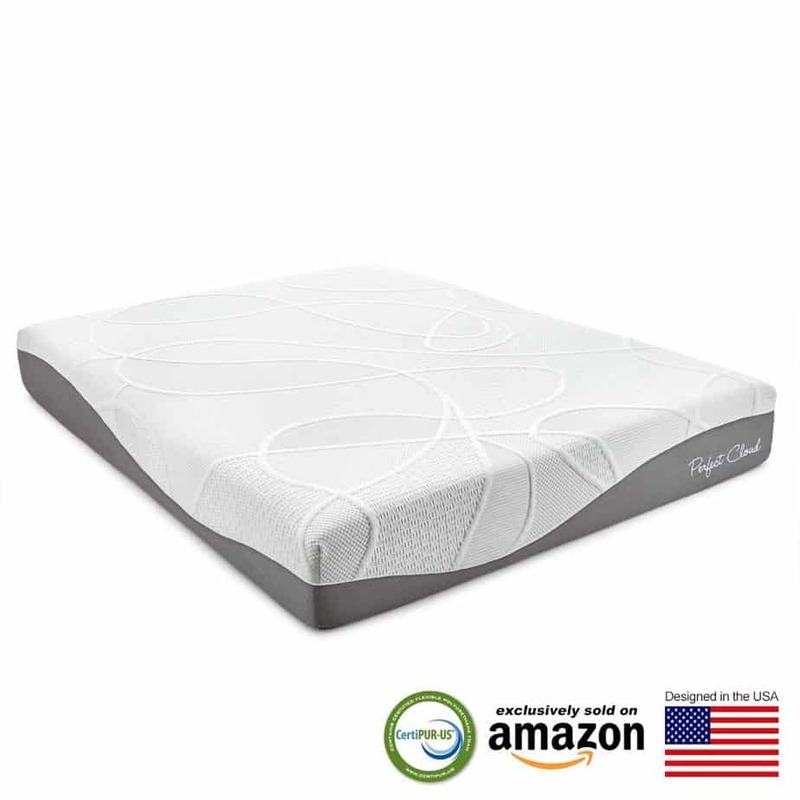 Enhanced with a 3-inch top layer from a 3lb density gel memory foam designed to provide the right levels of pressure relief for each individual’s unique body contours, sleeping comfortably just became realistic. 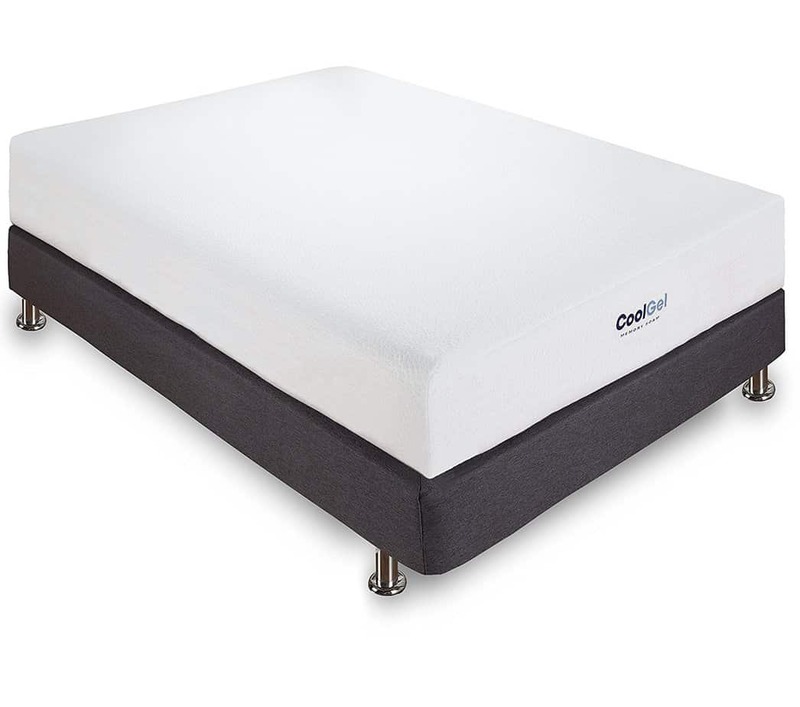 The support base is made from 7-inch base foam of 1.8lb density to provide the necessary degree of resiliency to accommodate each user’s weight while enhancing the ability of the top to provide a breezy sleep. This mattress is compatible with adjustable bases of all kinds thanks to its ability to conform to every sleeping surface without losing its structural integrity and durability. How can you become completely sure that this mattress suits your sleeping needs? Well, this is why it is available for a zero-risk 120-night sleep trial. The eLuxury Gel Memory Foam 10-inch is a top quality mattress that holds its own against some of the finest on the market. ​However, we have been especially thrilled with the fact that it is designed, manufactured, and assembled fully in the United States by a firm owned and operated by a US Military Veteran. Purchasing this mattress also allows you to give back to society since 1 out of every 45 mattresses sold is donated to charity. So buying this model means you won’t just be supporting one of our Veterans and his employees but you’ll also be contributing your bit to charity. Should You Buy Adjustable Mattress Bundle With A Bed Frame? 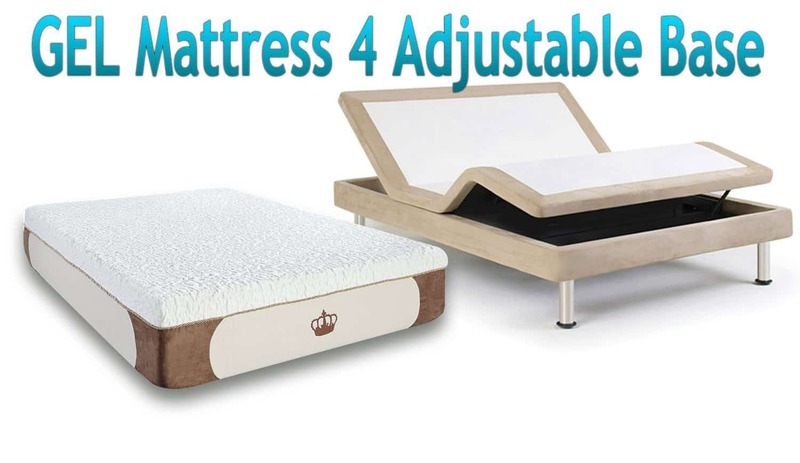 You can either buy an adjustable mattress independently or in a bundle that also features an adjustable base. The option you choose will largely depend on your circumstances as well as preferences at any point in time. If you don’t already own an adjustable base, then opting for a mattress and base bundle can be a great way to save some money. The only disadvantage is the fact that your options will be limited in terms of mattress choice. Also, in the event that the mattress ends up being unable to match up to your comfort needs, you’ll have no option than to splash out on a new mattress altogether. Therefore, it is important to conduct rigorous research if you decide to purchase a mattress and adjustable base together. What type of mattress is included in the bundle? How many inches of thickness does it come with? These are a few of the questions you should seek answers to. Buying an adjustable bed mattress independently is recommended in the event that you already own an adjustable base or want the freedom to choose a model that meets your sleeping needs. As long as you’re prepared to give up on the savings that come with purchasing the mattress and adjustable base together as a bundle, you’ll be fine. Keep in mind that going down this route skyrockets the probability of ending up with a worthy mattress that offers genuine luxury and complete peace of mind. We are proud to offer you the most up-to-date compilation of the best mattresses for adjustable beds available for sale right now. Our adjustable bed mattress reviews have been carefully crafted to highlight what the top models have to offer. Whether you prefer an 8-inch, 10-inch, 12-inch or 14-inch memory foam model, we’ve got you covered. The Classic​ Brands Ventilated Mattress is the clear winner due to its performance, price, and reputation. However, each of the 6 remaining options offer exceptional value for money so feel free to choose the most suitable one for your needs.